Published December 6, 2012 By Anna T. This post may contain affiliate links. Regardless, I only recommend sites I've researched and/or used and trust. And they have so many more! It's a great way to kill 30 minutes or so. 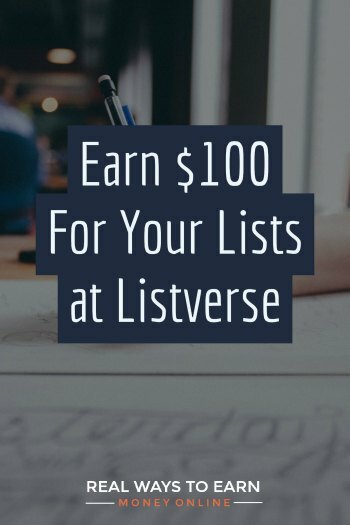 As stated above, Listverse is currently offering $100 for lists you submit that they publish. So your list needs to be good and something with a catchy title that people would want to read. If they decide not to publish your list, you of course won't be paid. Payments are made with Paypal upon acceptance of your list. If your list is in the top five most popular lists for the month, you'll get a bonus payment of $100. The post Listverse has up on submissions really explains this better than I can, but in short they need something interesting that's at least 1,000 words long with no less than 10 items in the list. Before you whip something up and send it in, take a lot of time to read through their site to kind of get a feel for what they want. This should help to ensure that what you do write gets accepted. Do You Have Your Own Blog/Website? If you do, here's another bonus — Listverse will let you include a link back to your blog/website if your list is published! And they claim to have over 15 million visitors per month, so this would be some awesome exposure. They are also willing to link up your book (if you have one you want to promote) or your Twitter account with your list. You agree that you voluntarily transfer all rights relating to the content to Jamie Frater (representing Listverse) if and when it is paid for. Rejected lists remain your property. Someone on the Work Place Like Home forum (no longer in existence) gave it a go and got a list published. This person also reported receiving the $100 payment immediately upon getting her acceptance email. It's clear that they do publish a lot of lists — it appears there are thousands published across all the categories they have, so I would assume they accept lists regularly. Want to Make a List? You can go here to send in your submission. This is the most profitable route to take as a freelance writer. You can get your own clients and set your own rates, which you cannot really do with Listverse or other content sites. A six-figure income is not outside the realm of possibility when you're running your own business. I created a list post published by Listverse, and never received a penny, nor a response to my emails. If you’re looking to earn money from writing, there are more reliable ways to do it. Sold two articles on Listverse. Plus side is that they pay promptly and I found that the editor is willing to speak one-on-one via email with me, which i find refreshing. When you submit a list, expect to hear back from them between 2-9 days, the longer, the better! Normally when they reject a list, they let you know the next day or on the second day. But that’s just my experience. Downside is that when a list is rejected, it truly is a lot of hard work and time down the drain. They do have a forum for writers (allowed entry once you sell your first list) where you can pitch ideas to them instead of writing up the whole article. But I find they take about two weeks to give you the go-ahead to write it or reject it, a bit long for me. But they are better than most sites and have a personal touch i appreciate. I also had several articles published on Listverse. Until recently, I was paid promptly. That ended in February 2018, when Listverse published published my list “10 Bad Hombres Whose Body Parts Became Souvenirs.” Instead of prompt payment, I received an email stating I would be paid in two weeks. The two weeks came and went and I received nothing in my Paypal account. What’s more, Listverse has ignored all my email messages. I searched the internet and discovered another Listverse author — Melissa Wittmeier — posting that she has not been paid for a list published about the same time. Again, Listverse ignored her emails. I believe Listverse has hit some financial problems, and can no longer pay, however, the site operator is apparently trying to pretend there is nothing wrong. My name is Nolan Moore. I’m a regular writer over at Listverse, and my experience has been nothing but positive. If you like to write and want to make $100, you should definitely give it a go. As to the subject of rights…if the folks at Listverse buy your list, they gain all the rights. You can’t publish it anywhere else. It belongs to them forever. However, they only get the rights if they buy the list. If they decide they don’t want to publish your article, the rights still belong to you. You can then feel free to submit it to another site. As for wait time…after you submit your list, you’ll hear back from the Listverse editors within two weeks. If anyone has any other questions, feel free to shoot me an email! You can reach me at nolanmoore.88@gmail.com. Now the question is just what it means for them to retain the rights when they publish a list. Can you publish it elsewhere if you 1. just change the title? 2. re-order the list? 3. Re-create the list making variations throughout in the language? Anyone know? After a site like this has been around awhile, it is hard to be original. A few days ago, I sent what I thought was a unique list not already on the site. It got declined. Maybe it was too factual. I read on a forum the acceptance rate is only 30%. Any site that pays writers should keep up with tax info. I have doubts about this site. I submitted my article on Jan 15, 2014, and I heard back on the 21st. Listverse is a lot of work for nothing. Checking ScamAdvisor, it says that Listverse is 100% safe to use and trust. Also, being a Listverse reader for a while already, I fully recommend it. I submitted a list to them last Monday morning. I sent them a follow up email on Monday, and I haven’t received a response. Has anyone received one and how long does it take to hear back? After reading your article (I’ve been trying to research Listverse to see whether it was worth writing for), I went and checked the TOS. I realize this article is a few months old, so maybe they recently changed it? Thanks Dennis, hopefully they did change it! That is good to know. When I wrote the article, it definitely read differently. i have been a listverse fan for about two years.but the fact that they dont inform you when they reject an article is scary…i might give it a shot this week. I don’t believe that is legal. It doesn’t fall under the heading of writing for hire.. Changes are that they don’t use the vase majority of content that comes through their site. They are cataloging and profiting off the sweat of writers and playing them for cheap. Would any other worker be subjected to this type of insult? For instance would a lawyer write up a brief and give it to a client, and then if the client didn’t use it, it’s free? No. I am going to give it a shot anyway! This sounds a cool way to earn if you are a talented writer. I have an interesting idea and this weekend I would create a list and submit to that site. Let’s see if it gets accepted. Awesome opportunity, Anna! Thanks for sharing! I really wanted to give this a go, but again the thought of giving up rights to a 1000 word article that may never see the light of day – or get released as a plr by the owner is a bit much. I emailed them some ideas as it says you can, but didn’t hear anything back. A few alarm bells are ringing with this one I have to admit! I was soo tempted to submit a list the other day, but I hate the thought of giving up the rights on something that may never be published. If you were able to retain them on unwanted lists that would be another thing. You could then at least publish them elsewhere. 1,000 words is a lot of work for nothing! Thanks for the update! I was seriously considering this, as probably all of you were, as a way to get paid for guest post that would link back to my website. Giving up my rights is a no go, though. Still…$100, lol! It’ll take years before any of my stuff earns that much. Thanks, I have been waiting for this update. It is strange that he wants full rights even if its not published. What is he going to do with it, rewrite or spin the article? Hmm. May be worth a try though. I have some extra time tomorrow so I may work on a title and list. Good to hear there is only a 7 day turnaround and that they pay right away. The pay was my biggest concern. I agree, Julie. I think it’s a little strange that they want full rights even if they reject your list. Most sites that let you submit content don’t have that rule. But I felt a little better knowing that someone on a forum I visit gave it a try and was paid. If I knew I could get something written up in 30 minutes or so, I might be willing to try it. Lists take more than 30 minutes. More like two or three hours minimum. You must provide links to “reputable” online sources for every fact, and they want two or three facts for each of the several items on the list.